Yesterday, I got the above in a newsletter from our health insurance company, and I was intrigued… Until I read the fine print, and I realized that they basically just sabotaged their clients with REALLY bad information. This is what I think of this “healthy recipe advice”. First rule: Don’t be fooled by “sugar free”. It uses sucralose, which is NOT HEALTHY OR OK. Sucralose has been associated with all kinds of issues, from decreasing gut flora (the good bugs that help you), to breaking down into harmful chemicals when heated, to causing brain fog, to increasing insulin and glucose levels in already obese people. (Yes, obese people using Splenda have a blood sugar and insulin increase despite it being “no calorie”. Study here) At this point, in 2019, the only artificial sweeteners I personally use are monkfruit (100%, no other ingredients) or stevia leaf (again 100%, no other ingredients). Both made from natural plants. This cake has 3 ¾ cups of ALL PURPOSE WHITE FLOUR! WTH? What do you think happens to flour once it is eaten? IT TURNS TO SUGAR WHEN YOU DIGEST IT. CARBS=SUGAR. As evidenced by the sugar level in the nutrition info. More on this in a minute. It uses brown sugar substitute malitol. Sugar alcohols (anything ending in an “ol” is a sugar alcohol) also mess with your gut flora, and combined with other sweeteners like Nutrasweet can wreak havoc with your gut, causing bloating, gas and diarrhea. This is healthy? It uses butter. Butter is fine, but ONLY if you use pasture butter. I personally would switch this out to coconut oil in the cake. If you don’t use pasture butter, you’re getting your butter from factory farms where the cattle are fed antibiotics (because they stand in horrible dirty conditions) and produce butter that has much higher Omega 6 fats (bad fats) than pasture butter, made from cows allowed to graze on their natural diet: GRASS. Grass fed cows produce PASTURE BUTTER. Worth the extra $$. Unless you’re ok with heart disease. Wow. Look at the carbohydrates and sugars. This has more carbs than 100 Reese’s Pieces! So, if you’re trying to lose weight, or even worse, are pre-diabetic or diabetic, avoid this like the plague. This will make your insulin spike, add calories you don’t need and provide NO NUTRITIONAL VALUE. 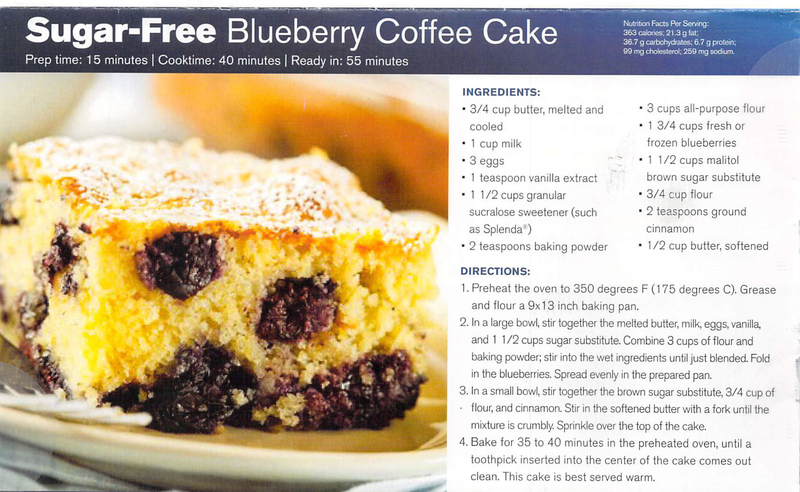 Not only is white flour stripped of most nutrients (they add vitamins back in to make it more saleable), but the blueberries are probably the only redeeming ingredient. Again, I’ll remind everyone of my best advice from author Michael Pollan: “If it grows as a plant, eat it, if it’s made in a plant, don’t.” Where do you think processed flour, and artificial sweeteners are made? Eating this is like throwing a hand grenade at yourself. Eating this is like throwing a hand grenade at yourself. So, you want to know what you should eat for breakfast instead of this? How about some organic blueberries, and two scrambled eggs? Healthy fats like eggs and coconut oil or ghee give you STAYING POWER, lower your insulin and do wonders for your overall health. A Healthy Breakfast/ Feel free to add vegetables or avocado. When you place these side by side, it is hard to argue. Look at the shaded area in particular. Compare the sugars. What happens in your body? Insulin spikes, creating both further hunger AND inflammation. I won’t even address the effects of gluten but you can read more at the link. 2 eggs, 3/4 cup fresh blueberries and 1Tbs coconut oil on left. And finally, look at the protein content. I say the cake from hell is on the right! Left: Eggs, scrambled with blueberries. elanaspantry.com Elana Amsterdam’s great website. Just watch the carbs. againstallgrain.com Danielle Walker’s website with links to get her cookbooks and recipes online. My recipe for pancakes is here. Add blueberries! With any recipes I link to, remember my rules about artificial sweeteners. No Splenda, no nutrasweet, no saccharine, no sugar alcohols. I think it is better to add honey or maple syrup than to regularly use ANY artifical sweetener. Once you get away from sugar, you will realize most of our pre-made food is too sweet. And, it’s killing us. Previous PostWhat hunger REALLY means.